Practice to groove your swing and create "muscle memory." Spending a beautiful day on the golf course can be a lot of fun, but in order to enjoy the moment, you need to work on basic swing techniques at the driving range. If you are unsure of proper form, consider taking a lesson in a group clinic or taking private lessons. Jot down some notes, and then the rest is up to you. Begin your golf swing with a pre-shot routine. Clear your mind, concentrate on golf, and place your feet as wide as your shoulders for a shot off the tee. Decide on a grip, and place the club between the first and second joint of your index finger back to the base of your pinkie. The heel of your hand will be on top of the club with the thumb to the back. Place the ball off the inside of your front foot, and make sure the clubface and your body are square to the pin. Assume the correct posture and balance. Your knees, arms and shoulders should be tension free, and your weight should be near the back near your heels. Turn your shoulders around your spine for the takeaway. Your left arm should be straight or slightly bent, and your left shoulder should approach your right armpit. By the time your left arm is parallel to the ground, your wrists should be cocked at a 90-degree angle. 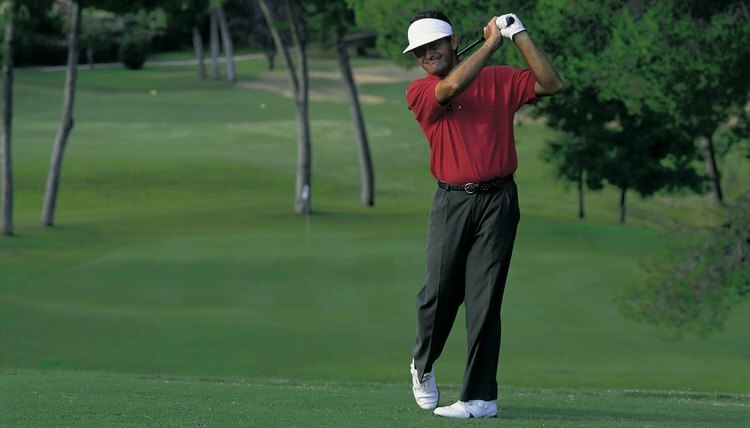 As you make the shoulder turn, your weight should shift to the back leg. The heel of your right foot stays planted. Start moving the left knee toward the pin for the downswing. As your body uncoils, your weight should shift to the left side. Keep your wrists cocked until impact with your thumb pointing up, as if you were shaking hands. As you hit the ball, your arms should be straight and stretched out by centrifugal force. You should hit the ball squarely in the sweet spot of the club. Follow through with your left foot down and your chest facing the target. Your right heel will be up, and your right toe will be pointed toward the ground.